This fun Thanksgiving Song is a great activity for kids on Thanksgiving Day. When my second son was in kindergarten (2007), he came home one early November day singing the cutest Thanksgiving Song. He sang “I don’t want to eat the turkey”, with so much exuberance and gusto that it has stuck in all of our heads as a favorite each year. I Don’t Want to Eat the Turkey is a cute little Thanksgiving song about a child who has come to love the turkey, and wants to keep it as a pet. We sing it every year. It is sung to the tune of Battle Hymn of the Republic which most adults know and it’s easy enough for kids to catch on. I love to use a printable to make learning the song easier and more fun. 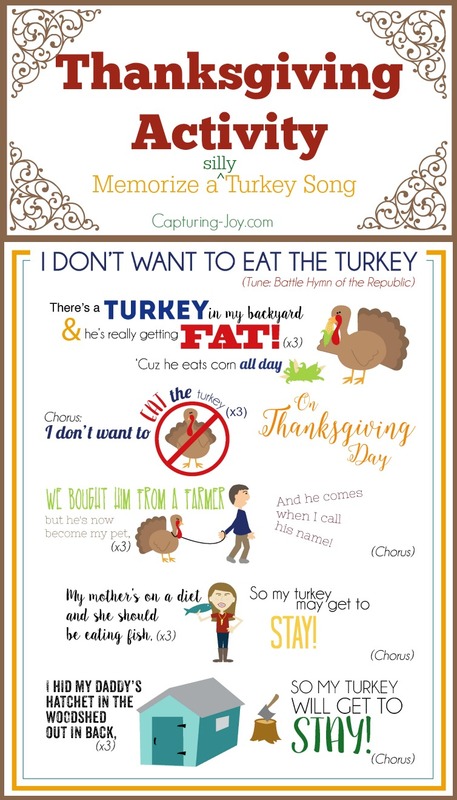 We originally used this printable to learn the Thanksgiving song, and it is still great for adults that want to sing along, you can download this first version, or the one below with more drawings on it to better serve the younger kids and help them remember. But when I taught my daughter’s 1st grade class this fun Thanksgiving song, I wanted a more kid friendly printable. I had my designer create a printable with extra images to make it more fun. It uses the same design as the “memorize” series I’ve shared in the past year. My kids still LOVE this song and I hope your kids will too! 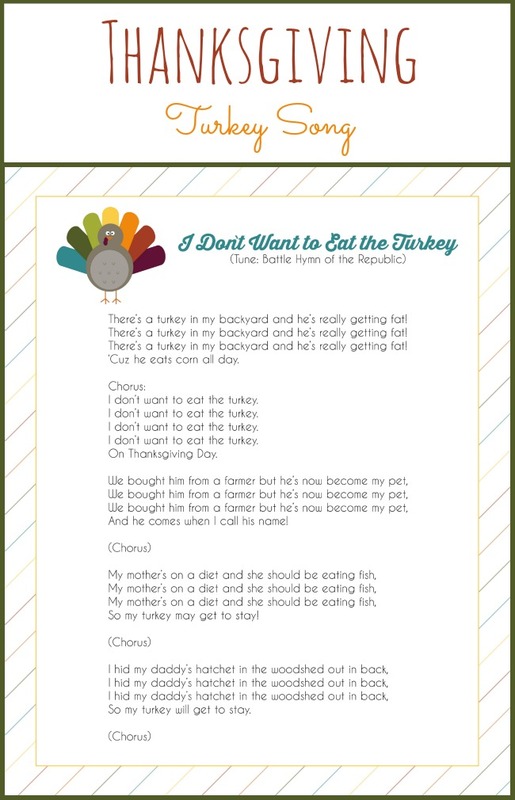 Download the I Don’t Want to Eat the Turkey Thanksgiving Song Printable HERE! The Thanksgiving song printables are both 8×10 in size, so they can easily be transferred onto a Word Document to print at home or printed as a photo. 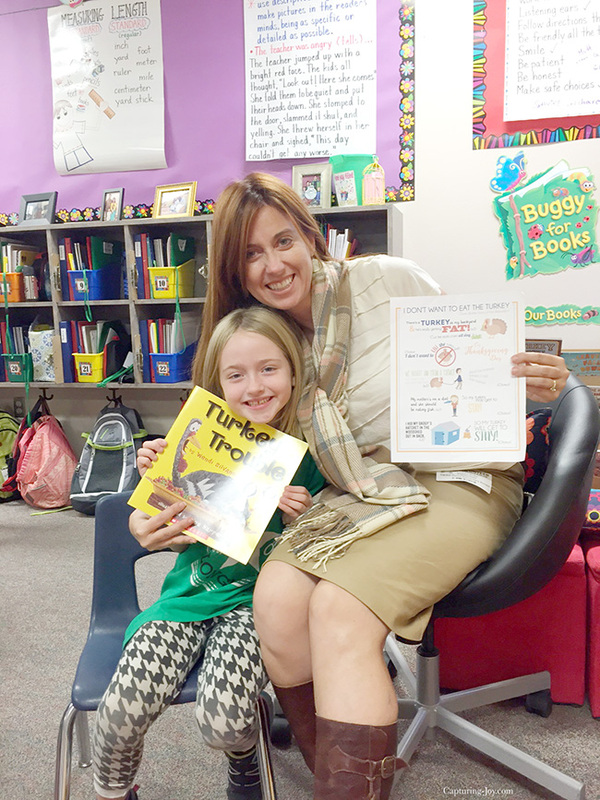 When I teach this song to little kids, it is also fun to read the book, Turkey Trouble. It has a similar theme, and is oh so fun! I love having a stack of holiday books to keep out for the kids to peruse. Get your own copy of Turkey Trouble on Amazon! You might also enjoy 10 FAT Turkeys or Thanksgiving is for Giving Thanks. Or a bunch of other Thanksgiving kids books that we love! 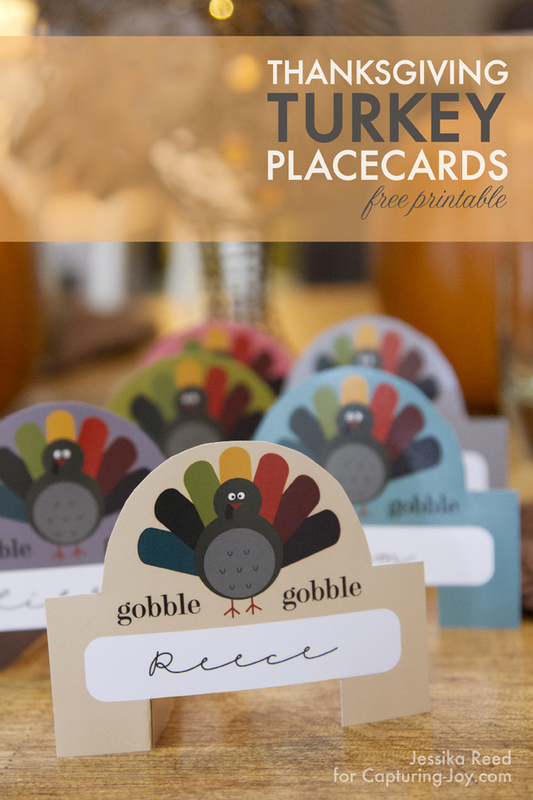 Need other fun Thanksgiving Activities for Kids?